Below are some recent winning stories from our dedicated RosterWatch PRO members, telling us about their success in both Daily Fantasy and Season-Long Leagues. Have an RW PRO success story? Send an e-mail to feedback@rosterwatch.com. Join us! Subscribe to RosterWatch PRO today for year-round NFL player analysis. RosterWatch is the only company dedicated to personally covering and analyzing fantasy football every day of the year – it’s easy to see why they are the rising stars of SiriusXM Fantasy Sports Radio. These guys do great, great work. The money I spent at RW is well spent and would never want it back. 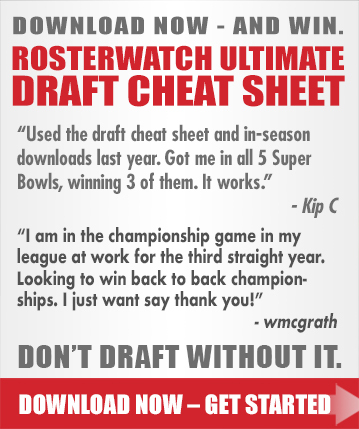 In fact, after using the draft cheat sheet I changed my membership from one month to a full year. I just want to say Thank You! I been a member for over about 4 years. This year I gave up on all the other guys and just stayed with you guys. I’m in 7 leagues making the playoffs in all 7 and looking like ill be taking home at least 3 of them. Just wanted to send you guys a thank you. I’ve been playing fantasy football for 6 years and been a member of RosterWatch Nation for 5. I’ve made the playoffs every year, except for last year when I got hit hard by the injury bug, and even then I could have been in if I had won my last game. Finished in 1st place this year and now headed into the playoffs. Thanks for all of you guys’ hard work and commitment to the members of the Nation! All due to your draftkings advice. Used the cheat sheet and in season downloads last year. Got me in all 5 “Super Bowls,” winning 3 of them. It works. I’ve used many other sites, and I listen to Sirius XM fantasy sports. You guys are definitely the best! “I love the RosterWatch site and articles for my fantasy football leagues and daily fantasy games. The weekly matchup tool is my favorite and I use it for everything: Single week, standard, and with the sports book. For example, I couldn’t believe their Doug Martin pick but added him to my season-long teams and guess what? Last week he totally came through. It was an amazing call! @RosterWatch I signed up for pro on Saturday and u helped me double my money this weekend. Really like the cheat sheet. Very helpful. @RosterWatch You guys are radio gold on @SiriusXMFantasy. I played Stevie Johnson and cashed tickets at @FanDuel. @RosterWatch 2.99 a month? Thanks for the deal. Had a Great weekend on @FanDuel and @DraftKings . Check out @RosterWatch ! This is gonna be Great . Have a good week.